Though you would think he has enough on his plate with overseeing pretty much every DC TV show going (all five CW series plus Titans), producer Greg Berlanti has got yet another DC project in the works, this time on the film side of things. Back in 2015, it was revealed that the Arrowverse showrunner was working on a Booster Gold movie for Warner Bros. However, things haven’t progressed very far over the last few years. While plugging his new film Love, Simon though (a romcom this time rather than a comic book blockbuster), Berlanti was asked by TheWrap to clarify what was going on with his movie starring the superhero from the future. 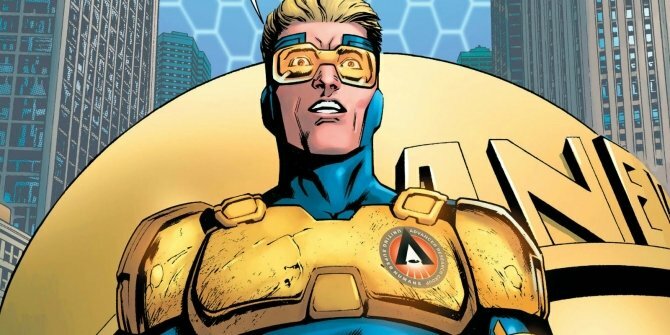 Thankfully, he had good news for Booster fans, as Berlanti confirmed that it’s still in development, revealing that the script is completed and he’s now waiting for WB to move forward. The producer explained that the studio’s big issue with it is that they’re trying to work out “how it’s going to fit into their greater landscape.” This makes sense when we remember that Berlanti previously told us that Booster Gold would fall outside the DC Extended Universe. Though that was big news at the time, we now know that WB is working on other non-DCEU projects like the Joker origins movie. As such, Berlanti can’t offer any light on exactly when we can expect Booster Gold to arrive. After all, the DCEU slate is already bursting with other projects in various stages of development – everything from The Batman to Batgirl – so Warner Bros. have their hands full sorting out what goes where. Lastly, the producer spoke a little bit more about the draft of the script, which was previously revealed to have been written by Zack Stentz (X-Men: First Class, The Flash). Once again, Berlanti made clear that the ball is in WB’s court. Tell us, would you like to see a Booster Gold movie more than, say, Shazam! or Aquaman? Let us know in the comments section below!